So, Chichian and I have both recently had issues with Steam that required us to create a support ticket. Steam has a rather obtuse system for support tickets, and for many users, it apparently doesn't work at all. 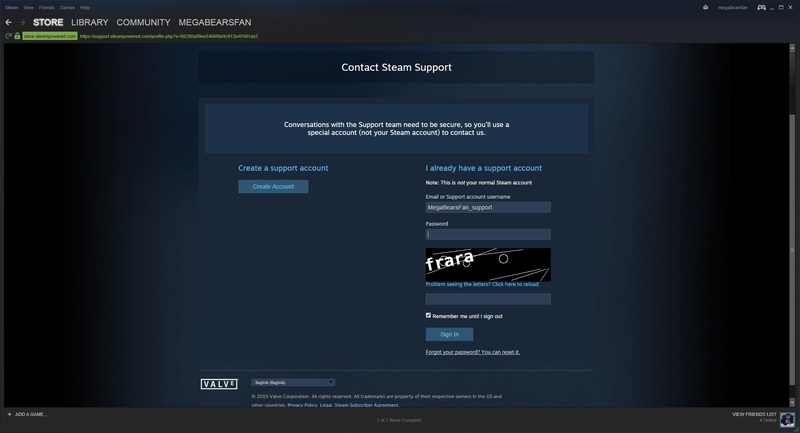 First and foremost, Steam's support requires that you make a separate account just for support. You don't log into Steam support using your existing Steam account. Supposedly, this is because the most common ticket is to retrieve access to a lost account. Either the player forgot their account info, or it had been hijacked. So in order to prevent people from having to make a whole separate Steam user account just to create a support ticket to retrieve their old Steam account, they set up this system in which support is its own separate account to begin with - for everybody. So even if you have full access to your Steam account and only want to report a bug in the client or have an issue with a purchased game not showing up in your library, you still have to go to the trouble of creating a completely separate account. 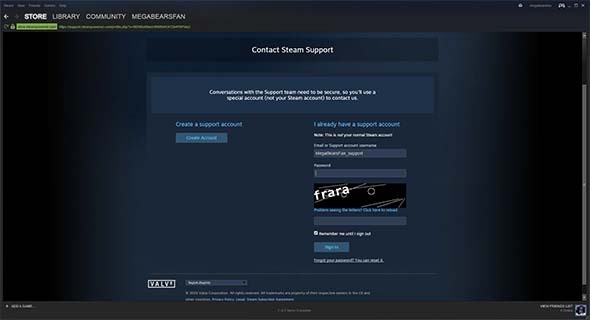 Steam Support requires a separate account from your normal Steam account. You then have to go through the email validation process. After you create an account, they'll send you a verification email. Pretty common stuff. Unfortunately, many users (including myself and Chichian) never get these emails. The same might apply for email requests to reset a password if you forgot your support account's password. The email doesn't go into a spam folder. It doesn't go to the wrong account. It doesn't show up two days later because their emailer services are slow. The emails simply never show up. You're not crazy, there is an explanation. Apparently, some email providers completely block Steam Support from sending emails to their users for ... some reason. I guess they think Steam Support is some kind of spammer or malware threat? Usually, you'd expect such an email to get sent to a spam folder. But not in this case. It's really annoying that providers are able to simply refuse traffic from specific sources, especially a source that is legitimate like Steam. Use a gmail account for Steam Support. So bottom line: if you are having issues with creating or accessing a Steam Support account, you're not alone. If you're waiting for validation or password reset emails that simply never show up, it's probably because your provider is blocking them. Chichian's Steam Support emails were blocked by Hotmail. Mine was blocked by AOL. It appears that gmail does not block Steam Support though. We were both able to receive the emails when we created an account using gmail. So if you are having issues, I recommend using a gmail address to create your Steam Support account. It will save you some confusion and frustration.